This large map, measuring 71 x 98cm, details the topography of Rome and its environs, from Lacus Sabatinus [Lago di Bracciano] in the north to Norba in the south, and from Nerola in the east to the Mediterranean in the west. Unlike most modern maps, it is oriented with north to the left, so that one finds the Mediterranean coastline running parallel with its lower margin. The entire map is contained within a black border, "mounted on cloth, and folded in a case so as to form a separate volume" (Anonymous). On this broad canvas, highlights of the natural environment, as recorded by Gell's trigonometrical survey in 1822 (I: vi), appear alongside features of the artificial environment, as they existed in Classical times. Both dimensions are elaborated in meticulous detail: the former includes mountains, hills, lakes, ditches, streams, rivers, canals, and parts of the coast; while the latter numbers cities, villages, villas, towers, tombs, roads, ruins, and bridges. Mountains and hills are rendered with hatchures and shading; large bodies of water are edged olive-green; Rome is painted pink; and most of the larger features are identified by their Classical names. And in order to negotiate the map's particulars, viewers can turn to the key or "Explicato," found in the lower left-hand corner of the design, which explains its system of representation: Towers are identified by the letter "T," ruins by "R," sepulchers by "S," and so on. Finally, to determine the distance between features, two scales are provided, which take "Milliaria Romanæ" (Roman miles) and "Milliaria Geographica" as their respective points of reference. 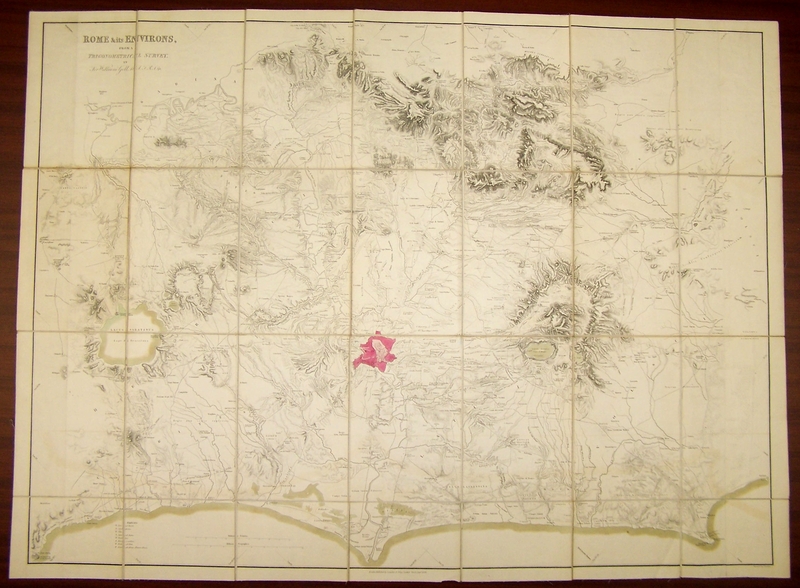 "Rome & its Environs, from a Trigonometrical Survey," was completed in 1822. Although first engraved in Rome, it was re-engraved in London, with financial support from the Society of Dilettanti (Clay 2), and published with Gell's two-volume Topography of Rome and its Vicinity (1834). This image has as its subject the topography of Rome and its environs—their natural, geographical features, as recorded by Gell's trigonometrical survey; and the artificial environment, as it existed in Classical times. This subject is further developed in The Topography of Rome and its Vicinity (two volumes), published along with the Map in 1834, which adds, in alphabetical order, brief accounts of each of the places named on the map, including "a portion of their history" (I: v). "Topography"—formed from the Greek words topos (place) and graphein (to write)—has three primary meanings: "the creation of a metaphorical equivalent in words of a landscape"; the "representation of a landscape according to the conventional signs of some system of mapping"; and terrain that is being mapped (Miller 3). With regard to "Rome and its Environs," all three senses of the word are relevant. It represents the natural/artificial features of its subject using a conventional "system of mapping"; these cartographic signs (lines, hachures, shading) are supplemented by writing (symbols; general and proper names), which identifies a myriad details; and these details are elaborated by the work accompanying the map, Gell's The Topography of Rome and its Vicinity. Map, viewer/reader, and book therefore together define a work that, as has been argued of topographical maps in general (Casey 155-7), seems midway between map and landscape painting, science and art. Or to adopt a different analogy, this work is like Google Earth, to the extent that it invites viewers/readers to move from the global (the overview) to the local (the part). But, of course, unlike Google Earth, "Rome and its Environs" is able to transport its audience to the Italian peninsula in Roman times. We can therefore say that "Rome and its Environs" is significant not just for the light it sheds on the topographical tradition in the early nineteenth-century, but as a vehicle for thinking through the relation, at that time, between art and science, history and cartography, visual imagination and objective description. Whether used as an aid for teaching, virtual tourism, or scholarly research it opened a window, for its nineteenth-century readers/viewers, onto a space much larger and more distant than those normally encompassed by the panorama. From the perspective of the 21st century, it offers an interesting case study of the ways in which objects of knowledge and of actual/virtual experience are constructed. For Gell, the most important function of "Rome and its Environs" was pedagogical—it provided, he believed, a topography so detailed that "a student reading the account of any battle may be certain that here stood such a height & there ran such a brook" (Gell in Italy, 59). Reviewers added other roles. In the pages of the Athenaeum, for example, it was described as likely to "find a place in every good library by the side of Gibbon's History," and as "absolutely indispensible" for the "classical scholar and student" [Anonymous 557]. In these contexts, "Rome and its Environs" functions variously as orientation device, archive of information, and device for imagining the environment in which historical events took place. These features enable it also to function as a guidebook (although admittedly rather unwieldy) for actual travel to Rome and as a vehicle (whether the viewer is in England or Italy) for virtual travel to the Classical Age. [Anonymous]. "William Gell's Topography of Rome and its Vicinity" [Advertisement]. Foreign Quarterly Review 19 (1837): 557. Casey, Edward S. Representing Place: Landscape Painting and Maps. Minneapolis: University of Minnesota Press, 2002. French, Josephine, ed. Tooley's Dictionary of Mapmakers. 4 vols. Rev. ed. Riverside, CT: Early World Press, 1999-2004. Gell, William. Sir William Gell in Italy: Letters to the Society of Dilettanti, 1831-1835. Ed.Edith Clay. London: Hamish Hamilton, 1976. Gell, William. The Topography of Rome and its Vicinity. 2 vols. London: Saunders and Otley, 1834. Miller, J. Hillis. Topographies. Stanford, CA: Stanford University Press, 1995. Wroth, W. W. "Gell, Sir William (1777–1836)." Rev. by Jason Thompson. Oxford Dictionary of National Biography. Oxford University Press, 2004; online edn, May 2006 [http://www.oxforddnb.com/view/article/10511, accessed 13 Nov 2013]. Rome and Its Environs, from A Trigonometrical Survey. By Sir William Gell, M.A. F.R.S. &c. London, Published by Saunders & Otley Conduit Street, Septr. 1834.